Where has the time gone today? This morning I started to go through old photos to scan and crop ready for some scrapbook pages and have come across photos of some cards I made over the past year. Unfortunately, I am the worlds worst photographer as I obviously didn't have enough light hence the picture quality is not very good. I have found a few internet websites that provide instructions on how to make a photo light box without it costing the earth so I will need to get busy making one. 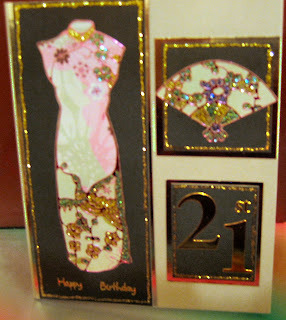 Anyway back to the cards...... this is a 21st Birthday card I made for my Nephew's then fiancee. 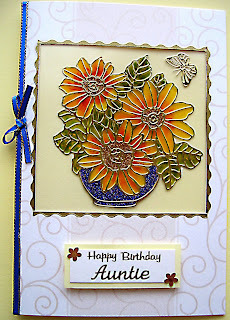 I used oriental peel offs which I stuck to Dovecraft Amethst - Floral Prints paper and finished with glitter glue. This was then attached to black card and matted onto gold mirri card. Continuing along the peel off and glitter glue theme here is another card I created, this time for my Auntie's birthday. I seem to have accumulated a lot of peel offs over time and I don't use them because they never look quite right. I think colouring them in with glitter glue changes how they look. I have other cards that I will upload but I haven't quite worked out how to set it all up yet. I wanted to just place the cards side by side but that doesn't seem to work. Oh well, I will post this and start a new post for more cards.